Some people want to stand out. They need to be the absolute center of attention all of the darn time. Not hunters. Hunters are subtle. They want to blend in with their surroundings. If they don't, then that ten point buck will bolt off into the woods. That's why Mossy Oak carries such symbolism! The woodland camouflage print helps you feel like master woodsmen, capable of stealthily navigating through any forest. Hunters and wilderness enthusiasts from coast to coast know all about Mossy Oak and these Mossy Oak suspenders are great for any outdoorsman! 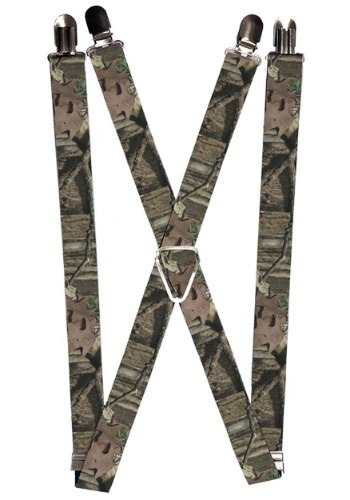 These suspenders will help you blend in with woods using the iconic Mossy Oak pattern. The suspenders are made from a durable nylon material and feature adjustable metal clasps that clamp into your pants. The straps measure 1 inch wide and are easy to use with any outfit. They're made in the USA and are officially licensed Mossy Oak brand. If you're a hunter or if you're just looking to blend in with your surroundings, then be sure to get some help from Mossy Oak! These suspenders can be the perfect way to finish off any outfit for your outdoor excursion.